Pobal is an organisation that works on behalf of the Irish Government to support social inclusion and local community development in Ireland. To create an educational and informative website, highlighting Pobal’s range of services, ensuring accessibility and ease of use were of primary importance. The Pobal site demonstrates exemplary User Experience (UX) Design as the project fundamentals were based on a design led methodology. Our fail safe User Experience process ensured that website Design was driven by User Interface Design validation and underpinned by an innovative use of technology, resulting in improved performance for Pobal.ie. Our Design process is focused on ensuring that users achieve what they set out to do on a website. Built firmly on the principles of user-centred Design; this involves asking the right questions and acting based on the information that is returned. We investigated what represents ‘success’ for the project and what represents ‘success’ for users of the website and how we best facilitate both. 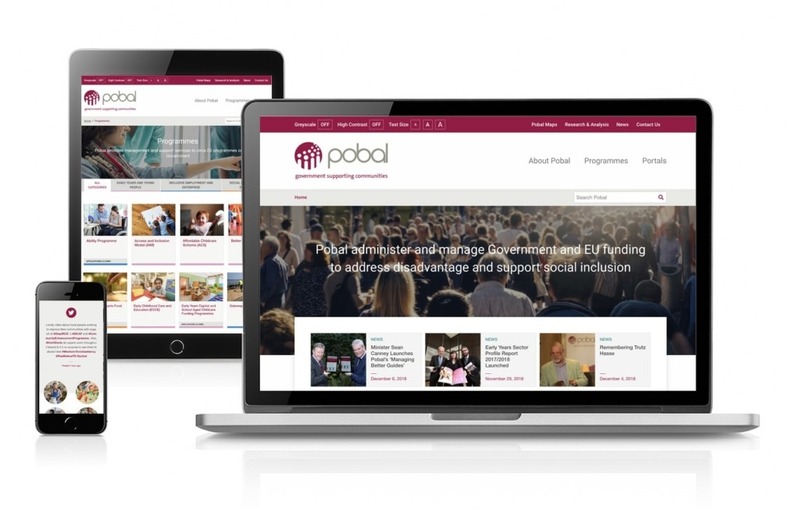 Success for Pobal was to ensure various types of users of the site achieved their goals and that the site followed best practice in terms of usability, accessibility, navigation and content. Accessibility was a key priority due to the unique demographic of users who utilise the Pobal site. The new site was an opportunity to improve User Experience by offering users an Accessibility panel to assist with site usage. The Pobal website was built on the WordPress Content Management System (CMS) on a PHP framework, with the front end developed using Zurb Foundation 6. WordPress was selected because of its easy to use content management system, ﬂexible permissions and workﬂows, social and CRM integrations and it is SEO friendly, a key consideration for this project. We tailored the CMS by creating a range of customised templates and custom fields for the Pobal team to add their website copy and images. We also configured a range of user permissions, created to allow Admins to edit various sections. WordPress incorporates in-built SEO capabilities which will support SEO activity underway with Pobal, including keyword research around key deliverables to incorporate into site content, meta titles and page descriptions. Greyscale – using a toggle switch, users can turn the site greyscale removing all colour from text and images. This is convenient for users with visual impairments such as colour blindness. This feature will disable colours that make a display more difficult to see and can make reading menus and viewing images more detailed for certain users. High Contrast – using a toggle switch, users can make site colours highly contrasting. This setting benefits users with low vision and or other visual impairments and will invert the web page background and text colours. Text Resizer – using a scale of three ‘A’s site users can make text larger or smaller to suit their individual reading needs. This makes the site more flexible and allows the user to take control to apply their own viewing preferences. We provided CMS user training session to enable Pobal to update the site going forward. Ensuring the client was self-sufficient and could use the CMS with ease. A seamless transition from the existing site, with a site launch plan managed by Zesty Account Management Team. Insights – Ongoing analysis and benchmarking to explain data, with a view to increase ROI on marketing and optimise the user experience. Year on Year (July 17 vs 18) the new site resulted in a 6% increase in users, with a 16% increase in new users – illustrating the steady improvement for the site. There has been a 17% increase in page views and a 29% increase in average page views per session, which demonstrates the improvement of content quality and presentation. Users can find relevant content more easily and are spending an increased amount of time-consuming site content.